U.S. Route 202 (US 202) is a highway stretching from Delaware to Maine, also passing through the states of Pennsylvania, New Jersey, New York, Connecticut, Massachusetts, and New Hampshire. The road has borne the number 202 since at least 1936. Before this, sections of the road were designated U.S. Route 122, as it intersected U.S. Route 22. Its current designation is based on its intersection with US 2 in Maine. US 202 continues north toward West Chester, joining with US 322 after intersecting U.S. Route 1. South of West Chester, US 202/322 exits onto a limited-access bypass of the borough; that is the old West Chester By-Pass, and includes a grade-level intersection at Matlack Street. North of West Chester, US 322 exits, and US 202 continues north as a freeway towards Frazer, where it interchanges with U.S. Route 30 and bends east to head towards Malvern and King of Prussia. The stretch between Mill Lane in Malvern to King of Prussia was recently widened to three lanes in each direction. In King of Prussia, the highway forms a large, complicated interchange with the Schuylkill Expressway, the Pennsylvania Turnpike, and U.S. Route 422. The freeway then transitions into a divided highway, passing the King of Prussia mall and heading northeast through commercial areas before splitting into a one-way pair through the streets of Bridgeport and Norristown, crossing the Schuylkill River in the process. North of Norristown, US 202 continues as a two-lane road heading northeast through the Philadelphia suburbs, passing through Blue Bell and Lower Gwynedd, where it becomes a four-lane full-access highway for about two miles (3 km). East of Lansdale, in Montgomeryville, it turns into a parkway with a parallel trail, which opened in December 2012. It continues northeast towards Doylestown, where it joins an older section of bypass at Pennsylvania Route 611 and proceeds north to the old alignment of Route 202 (State Street). It continues as a two-lane road to New Hope, crossing the Delaware River on the New Hope-Lambertville Toll Bridge. On the toll bridge, US 202 has two lanes in each direction. It continues a northeasterly course for about 5.7 miles (9.2 km) as a freeway. This segment of US 202 was earlier called the 202 bypass (as it bypassed the New Hope-Lambertville area) from its original route. The old section of 202 between New Hope and Ringoes, New Jersey is now NJ 179 which is also Old York Road, the first roadway to connect New York City and Philadelphia, Pennsylvania. In 1953, this section of Old York Road was renumbered US 202. A small section of the US 202 bypass was built in 1965 and the old route was renamed NJ 179. When the western section of the "bypass" was built to the Delaware River, the whole former segment was renamed 179. The section of the new US 202 freeway section ends once it begins to run concurrently with NJ 31 in East Amwell Township. The concurrency runs for five miles (8 km), to Flemington. This stretch, and the 13 miles (21 km) between Flemington and Somerville, is a four-lane divided roadway. US 202 just inside New Jersey at the NY/NJ state line. At Somerville, the road merges with US 206 at a now-reconfigured Somerville Circle. Parts of the old traffic circle, which also carries NJ 28, remain below the US 202 flyover. US 202 splits northeastward from US 206 at Bedminster Township and again becomes a two-lane road. From here to the state line, US 202 parallels, and has largely been supplanted by, I-287, which during its construction dumped traffic onto US 202. US 202 continues through Morristown to Morris Plains with an intersection with NJ 53. With a few exceptions, US 202 is maintained by counties rather than the New Jersey Department of Transportation north of NJ 53. US 202 continues past Boonton along the Boonton Turnpike to historic Mountain View in Wayne, where it then picks up NJ 23 for about two miles (3 km) and then exits on Black Oak Ridge Road. It then follows the Paterson-Hamburg Turnpike, Terhune Drive on the east side of Pompton Lake (past the former homes of Cecille B. DeMille and Albert Payson Terhune), and Ramapo Valley Road (more or less paralleling the Ramapo River through Oakland) to Mahwah before crossing the New York state line on the Franklin Turnpike. US 202 is mostly designated east–west in New York, owing to its greater coverage in those directions. Franklin Turnpike becomes Orange Avenue in Suffern, and US 202 continues to a block-long wrong-way concurrency with NY 59 before tailing off on Wayne Avenue and heading east toward Haverstraw. Most of this stretch is two-lane road. 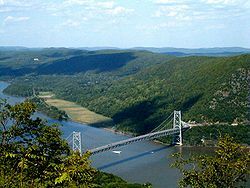 At Haverstraw, US 202 turns north along US 9W to Bear Mountain and then crosses the Bear Mountain Bridge, running concurrently with US 6, the Grand Army Of The Republic Highway. The two wind around Anthony's Nose, briefly forming New York's only three-way concurrency of U.S. highways with US 9 at Peekskill. Afterwards, the two separate for several miles, with US 202 taking the more southerly route through Somers. The highways reunite at Brewster and become a four-lane road for their last few miles before the state line, taking in NY 121 in the process. At Danbury, US 6 and 202 climb up onto I-84, which had just been joined by the north–south US 7, making a four-way concurrency. US 7 and 202 split from I-84 and US 6 at Exit 7. It is a two-lane road in southern Brookfield as it follows Federal Road. US 202 diverts from U.S. Route 7 at the next exit to a parallel surface route.The US 7 freeway continues for another 8.5 miles (13.7 km) before it rejoins US 202 at the Brookfield/New Milford town line. The now rejoined US 7 and 202 approach New Milford in bucolic Litchfield County, where they once again split. US 202 continues through Torrington and on to Cherry Brook, where it then runs concurrently with US 44 for several miles before turning northward at Avon. For the run to the state line, US 202 runs concurrently with Route 10. Unlike elsewhere in New England, US 202 is posted as a south–north highway in Massachusetts, as the highway runs mostly in those directions for its length through the state. US 202 and Route 10 enter the Bay State at the "Congamond Notch" in Southwick, a southward jog in the state line that includes Congamond Lake. North of Westfield, US 202 turns eastward toward Holyoke and Belchertown. It then heads north along the west side of the Quabbin Reservoir through New Salem toward Athol. This section of US 202 has been dubbed the Daniel Shays Highway, named for a Revolutionary War veteran who led an insurrection against the state government of Massachusetts. US 202 meets Massachusetts Route 2 at Orange, and runs along the two-lane freeway to Phillipston. There, it diverges to the north again as a two-lane road. In Massachusetts, US 202 passes through the municipalities of Southwick, Westfield, Holyoke, South Hadley, Granby, Belchertown, Pelham, Shutesbury, New Salem, Orange, Athol, Phillipston, Templeton, and Winchendon. The stretch of highway through Belchertown, Pelham, Shutesbury, and New Salem opened in 1935 to coincide with the completion and opening of the Quabbin Reservoir. The roadway reaches its closest point to the reservoir itself at the crossing of the Swift River, at the Shutesbury/New Salem town line. Access to the west side of the Quabbin Reservation is made through multiple gates in the three towns. There is no public access, however, to the Prescott Peninsula. US 202 is posted as an east–west highway in New Hampshire. It remains a two-lane highway for most of its length in the Granite State. It heads north, through Rindge, Jaffrey, and Peterborough, to Hillsborough, where it turns eastward along a concurrency with New Hampshire Route 9. The span of the road between Hillsborough and Hopkinton, which passes through Henniker, is among the most deadly sections of roadway in the state. At Concord, New Hampshire, the state capital, US 202 heads north and picks up a concurrency with US 3 for a short time, and then turns eastward again along Interstate 393, a freeway spur that also carries US 4. The freeway ends short of Chichester, and NH 9 rejoins the two-lane concurrency along with US 4 and 202. At Northwood, US 202 and NH 9 leave US 4. NH 9 splits off a few miles later, leaving US 202 to continue alone toward Rochester, where the road jumps up onto the Spaulding Turnpike (NH 16) for a short, non-tolled distance. US 202 leaves the turnpike two miles (3 km) before the state line at East Rochester. Connected farm in Windham, Maine typical of older residences adjacent to route 202 through rural New England. US 202 is posted as an east–west highway in Maine. The highway enters the state by crossing the Salmon Falls River at South Lebanon and bridges the Mousam River in Sanford. The highway then passes through Alfred, Waterboro and Hollis before crossing the Saco River at Salmon Falls. The highway passes through Gorham and crosses the Presumpscot River into South Windham. There is a rotary with U.S. Route 302 at Foster's Corner and an interchange with I-95 at Gray. The highway parallels I-95 through Upper Gloucester to Auburn and crosses the Androscoggin River into Lewiston, passing near the campus of Bates College. A very short stretch through the latter two cities is four-lane highway, but most of its length in the Pine Tree State consists of two-lane road. Its final miles west of Hampden, including the short overlay on I-395, and concurrency with US 1A also include four-laned segments. The highway passes through Greene, Monmouth, and Winthrop concurrently with Maine Route 11 and Maine Route 100, and becomes concurrent with State Route 17 at Manchester. US 202 runs concurrently with U.S. Route 201 as it crosses the Kennebec River at Augusta, and shortly thereafter it picks up State Route 3 and State Route 9. Maine 3 splits off at South China, but Maine 9 stays with US 202 through Albion, Unity, Troy, Dixmont, Newburgh, and Hampden almost all the way to its terminus in Bangor. When Maine 9 turns right onto Summer Street in Bangor with US 1A, US 202 runs four more blocks to its eastern (or northern) terminus at the US 2 intersection at the corner of Hammond, Main, Central and State Streets. U.S. Route 122 was created in 1926, connecting US 22 at Whitehouse Station, New Jersey with Wilmington, Delaware. It was extended to Haverstraw, New York in 1931 and became part of US 202 in 1934. In Pennsylvania in the early 1960s, a four-lane expressway was proposed that would follow the US 202 corridor. The "Piedmont Expressway" was to be 59 miles (95 km) long, and would cost approximately $146 million. It was to serve as an outer beltway around the Philadelphia area, similar to the Capital Beltway that encircles Washington, D.C.
Construction began in November 2008 on a parkway project between Pennsylvania Route 63 in Lower Gwynedd and the existing cloverleaf interchange at the US 202 Bypass and PA 611 near Doylestown. This parkway was planned to consist of a four-lane stretch between Route 63 and Pennsylvania Route 463 and a two-lane parkway the rest of the way that bypasses the boroughs of Chalfont and New Britain. The parkway opened on December 3, 2012. Southern terminus of concurrency with Route 10. 3.1 Route 168 east – Suffield CT, Thompsonville CT Western terminus of Route 168. 6.9 Route 57 west – Granville, Great Barrington Western terminus of concurrency with Route 57. 7.9 Route 57 east – Feeding Hills, Springfield Eastern terminus of concurrency with Route 57. 15.8 US 20 east – West Springfield, Springfield Eastern terminus of concurrency with US 20. 16.1 US 20 west – Russell, Pittsfield Western terminus of concurrency with US 20. 23.3 Route 10 north – Northampton Northern terminus of concurrency with Route 10. 32.8 US 5 – West Springfield, Springfield, Northampton Southern terminus of concurrency with US 5 southbound only. 34.1 Route 141 east – Holyoke Center, Chicopee Falls Southbound only. 34.4 Route 141 west – Easthampton Southbound only. 34.6 Route 141 – Chicopee Falls Northbound only. 34.8 US 5 north – Northampton Northern terminus of concurrency with US 5 southbound only. 35.4 US 202 southbound and northbound come back together. 39.1 Route 33 – Westover A.R.B., Chicopee, S. Hadley Ctr. 53.8 Route 21 south – Ludlow, Springfield Southern terminus of concurrency with Route 21. Route 181 south – Bondsville, Palmer Northern terminus of concurrency with Route 21. Northern terminus of Route 181. 88.7 Route 122 south – Petersham, Barre Southern terminus of concurrency with Route 122. 90.1 Route 122 north – Orange, Greenfield Northern terminus of concurrency with Route 122. 91.7 16 Route 2 west – Erving, Greenfield Western terminus of concurrency with Route 2. Route 2A west – Phillipston Eastern terminus of concurrency with Route 2. Western terminus of concurrency with Route 2A. 107.2 Route 2A east – Gardner Eastern terminus of concurrency with Route 2A. 109.9 Route 68 north – S. Royalston, Royalston Northern terminus of wrong-way concurrency with Route 68. 112.2 Route 68 south – Gardner, Worcester Southern terminus of wrong-way concurrency with Route 68. 121.8 Route 12 north – Fitzwilliam NH, Keene NH Northern terminus of wrong-way concurrency with Route 12. 122.1 Route 12 south – Ashburnham, Fitchburg Southern terminus of wrong-way concurrency with Route 12. 128.1 US 202 east Continuation into New Hampshire. ^ "U.S. 202 - Maine to Delaware - General Highway History - Highway History - Federal Highway Administration". www.fhwa.dot.gov. Retrieved 2018-06-02. ^ "Route 122 North Has Been Changed to 202". The News Journal. Wilmington, Delaware. March 15, 1935. p. 16. Retrieved March 20, 2018 – via newspapers.com. ^ a b Savana, Freda R. (December 3, 2012). "It's official: The 202 parkway is open". The Intelligencer. Archived from the original on January 31, 2013. Retrieved December 3, 2012. ^ DeLorme Mapping Company (1993). New York State Atlas and Gazetteer. DeLorme Mapping Company. ISBN 0-89933-230-7. ^ "Crash takes two lives" Archived 2007-09-27 at the Wayback Machine. Concord Monitor. June 2005. Accessed July 10, 2008. ^ a b DeLorme Mapping Company (1988). The Maine Atlas and Gazetteer. DeLorme Mapping Company. ISBN 0-89933-035-5. ^ a b "MaineDOT Public Map Viewer". Maine Department of Transportation. Retrieved April 9, 2017. "Interesting Trip to Maine". The Wellsboro Gazette. Wellsboro, Pennsylvania. July 3, 1935. p. 3. Retrieved March 20, 2018 – via newspapers.com. Wikimedia Commons has media related to U.S. Route 202.